This article is about every French colonial possession in history. For the current French overseas possessions, see Overseas France. During the 19th and 20th centuries, the French colonial empire was the second largest colonial empire behind the British Empire; it extended over 12,898,000 km2 (4,980,000 sq mi) of land at its height in the 1920s and 1930s. In terms of population however, on the eve of World War II, France and her colonial possessions totalled only 110 million inhabitants, compared to 330 million for British India alone. 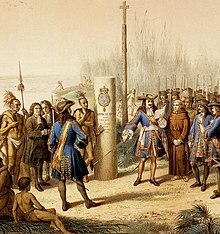 France began to establish colonies in North America, the Caribbean and India, following Spanish and Portuguese successes during the Age of Discovery, in rivalry with Britain. A series of wars with Britain during the 18th century and early 19th century, which France finally lost, almost ended its colonial ambitions in these regions, and without it what some historians term the "first" French colonial empire. In the 19th century, starting with the conquest of Algiers in 1830, France began to establish a new empire in Africa and Southeast Asia. The following is a list of all the countries that were part of the French colonial empires in the last 500 years, either entirely or in part, either under French sovereignty or as mandate. 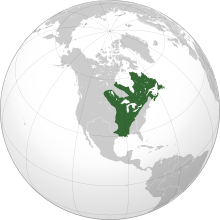 This map shows the Louisiana Purchase area, which corresponds approximately with colonial French Louisiana. ^ "Domaines nationaux - Consulat Général de France à Jérusalem". Consulfrance-Jerusalem.org. Archived from the original on 2010-09-11. Retrieved 2011-03-26. ^ "BnF - Voyage en Orient". expositions.bnf.fr. Retrieved 23 September 2017. ^ "Drapeau de Rurutu - Tahiti Heritage". www.tahitiheritage.pf. Retrieved 23 September 2017. ^ "Consulter le sujet - L'Australie serait-elle franĂ§aise ?!... • [Forums". Francedownunder.com. Retrieved 2011-03-26. ^ "TAAF". Taaf.fr. Archived from the original on 2012-01-20. Retrieved 2012-01-10. 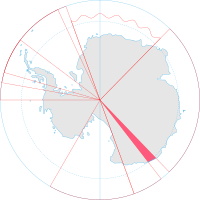 ^ "Kerguelen – yves trémarec – james cook – asia – hillsborough – rhodes". Kerguelen-voyages.com. Archived from the original on 2013-10-02. 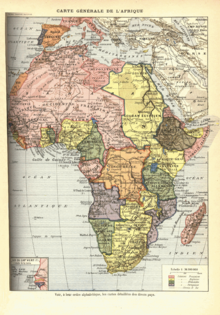 Wikimedia Commons has media related to French colonial empire.